Generally I have a policy of leaving nature to take its course. I am unable to care for baby critters – so if I see one that is by itself or looks a little in need, I may provide it some food or water, but I refuse to bring them indoors or try to ‘save’ them. This may sound a bit harsh, but you would be surprised how many wildlife babies are actually doing just fine and are separated from their parents by well-intentioned humans. Read the National Audubon Society’s article on what to do if you find a baby bird. Obviously, if the animal is in serious distress and I think that wildlife professionals need to be called, I will do so. I have learned my limitations and will not attempt to care for an animal myself. Nature was around long before I was here and it’s doing just fine. I do take exceptions to this rule when domestic cats are involved. Domestic cats can be devastating to wild bird populations, so if I can rescue a fledgling from their grips, I will do so. 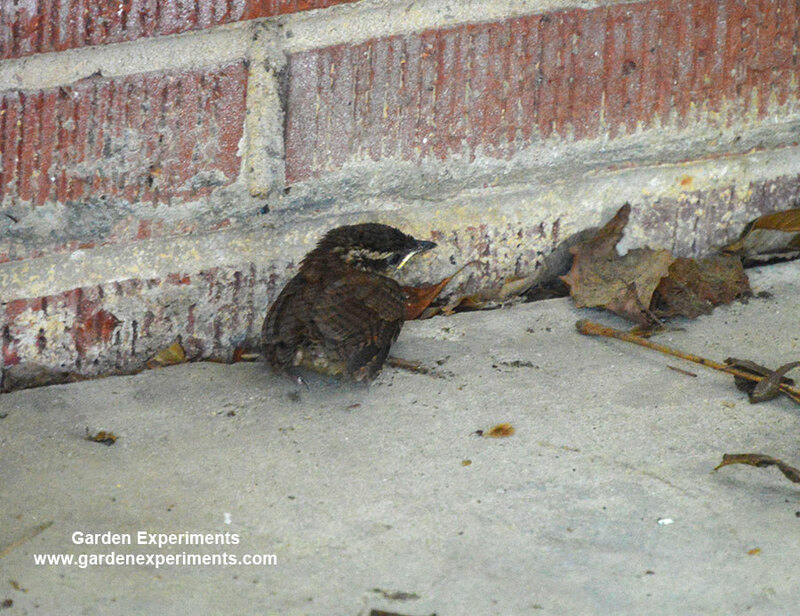 For weeks I watched a Jenny wren fly back and forth under my car port and feed its babies. Had I noticed her earlier, I would have deterred her from creating the nest in the first place in that location, but she snuck by me. I enjoyed hearing the baby birds peeping as I got in my car to head to the office. 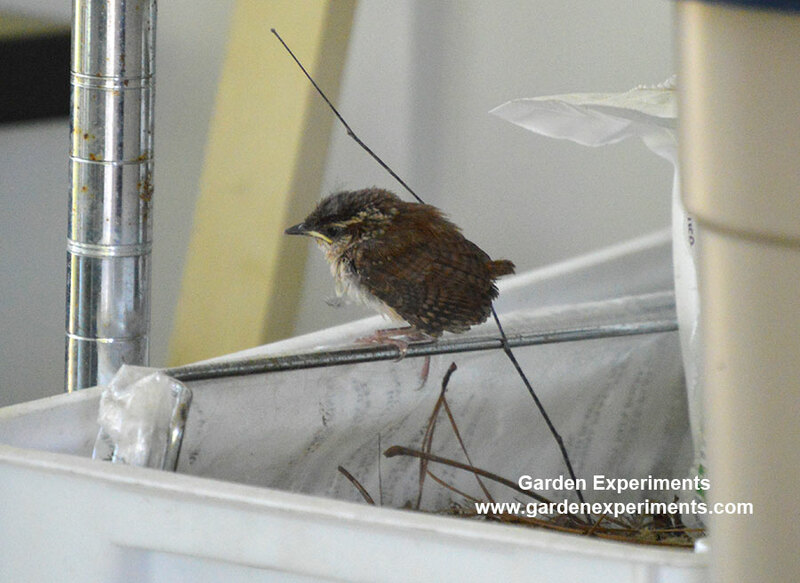 One morning I noticed that the fledglings were poking their heads out of the nest and a few hours later, the bravest one was hopping around on the floor of my carport. 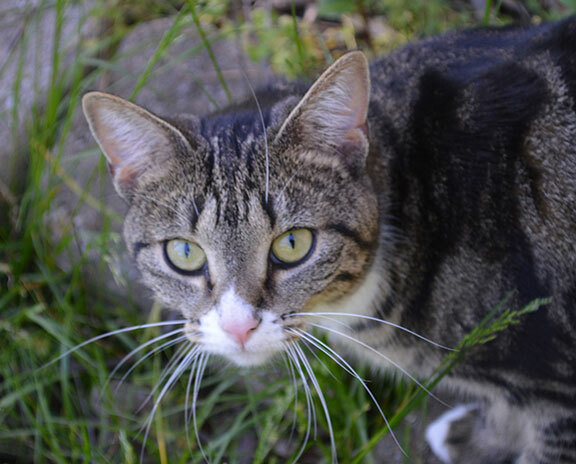 My neighbors have several cats – and the one that I particularly enjoy getting visited by (she’s super friendly) happens to be an avid hunter. Not a good combination. She and I had a few words that day. I attempted to deter the cat from approaching the carport with a broom – but to no avail. As soon as I went indoors, she came up to my house. As you can imagine, she ended up with the fledgling in her mouth. I chased her down and retrieved it, but she caught it again. This time I had to climb underneath some vines and a downed tree, traipse through the mud, and retrieve the baby bird from the woods after unsticking his foot from some twigs. I put him back in the nest and prayed for the best. This is when I took the photo below. His nest is in that plastic box which is only about 2 feet off of the ground. I figured I had given him the best chance I could and left it at that. I don’t know if he survived or not, but the cat did leave my yard after a while of fruitless searching. So I like to believe that he made it. I did my best to give him a fighting chance. Let’s hope he was a fighter. Oh, and me and the pink-nosed cat have made up since then. She’s just too friendly for me to stay mad at – and after all, that’s just the nature of cats. This baby bird was rescued from the mouth of a cat, twice. I sure hope he made it!